We focus on getting you the solution that’s the most effective, not the most expensive. We focus on a seamless user experience. Not all solutions are created equal. For example, we go to great lengths to hide the wire we run. This has included doing some very laborious drilling or making some creative camouflage. It may be easy to staple wire to the wall and call it a day, but we go to great lengths to make our products look like they were always there from the beginning. Aesthetics are important to your business’ brand and locks are no exception. We take great pains to make our products we install aesthetically pleasing. When is the best time to make noise at a hospital? Sunday morning. What about a restaurant? Mid-afternoon. Whatever your schedule, we try our best to accommodate you. We’ve been around for 40 years and we expect to be around for 40 more. 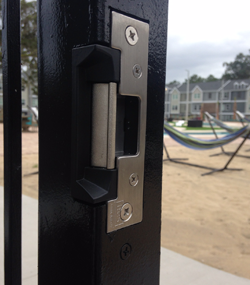 Public spaces such as pools and clubhouses typically use mechanical or electronic combination locks. Push button locks are more expensive than typical levers but pay for themselves when you factor in the cost of distributing large amounts of keys every time you decide to change something. We sell so many of these that we manufacture our own templates for installing them. We often work with other locksmiths, distributors, door companies, and security professionals who need extra help, or who have a specialized task they want to be done right the first time. If you are looking for a professional company to help with your recently awarded contract in Florida, give us a call. Some of our subcontracted services include Hardware Installation, Rekeying Services, Wire Running, electric Strike Installations, and many more. There are many different types of keys, some of them even say "Do Not Duplicate" on them, but very few are truly Restricted Keys. We own several restricted keys that only Mobile Locksmith in Gainesville, FL is allowed to buy or cut. If you own a business and are concerned about duplicates being distributed, this is a good way to ensure that the keys you distribute are the only keys out there. Card Swipes, Proximity Readers, Keypads, Fingerprint Readers, Magnets, Electric Levers, Motion Detectors, ADA Compliant Door Operators, video-enabled intercoms, and the list goes on... Whatever your security needs, whatever your building type, we can provide a solution that will fit your company. We use integrated access control software to ensure that you are able to track who has access to your building and when. Every project is different because your needs are always unique. Call us to schedule a free consultation on your security project. In addition to providing integrated access control solutions, we also install or replace electric strikes and electromagnets should your existing one break. Not every employee or resident should have access to every door, but the manager needs to be able to carry one key that will open them all. That is what master keying is all about. We have been perfecting the art of less-is-more with master key systems for the past 40 years. Give us a call for a free on-site consultation about simplifying your business' key system. 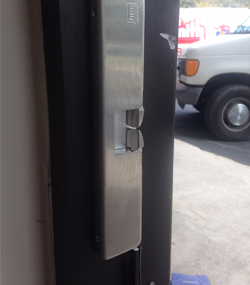 Commercial buildings typically have exit devices (push bars) installed on the exterior doors to allow people to exit in case of fire or emergency. We install and repair all types of hardware designed to keep your customers and employees safe. 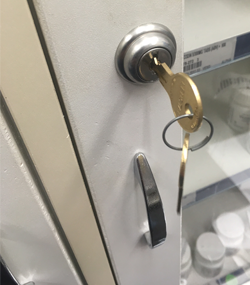 We often install locking hardware in unusual places. 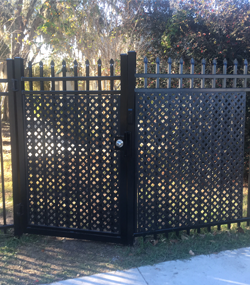 We fabricate and customize our implementation to meet our customer's needs whether you need to lock a pool gate, locker, or sub-zero freezer.